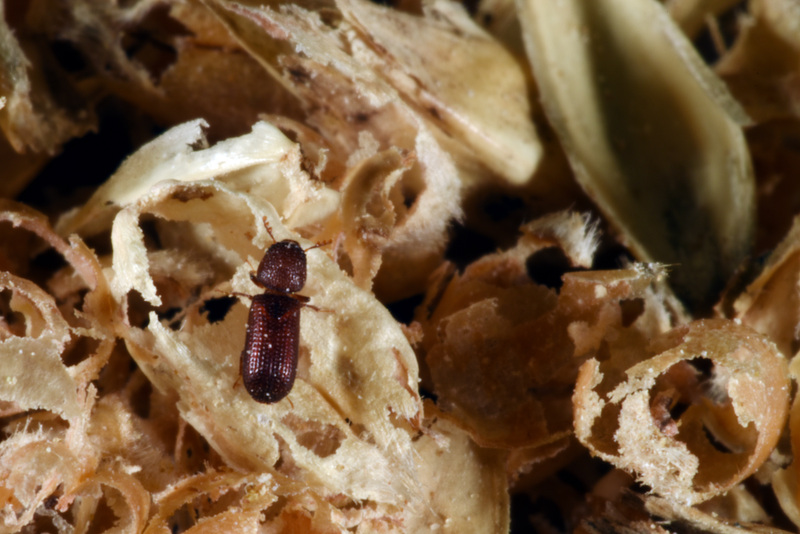 The lesser grain borer is a cosmopolitan pest of a wide variety of food. 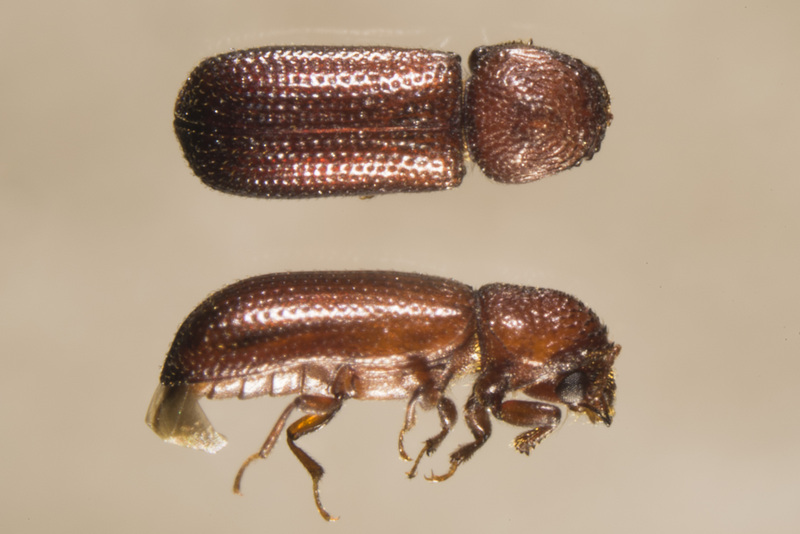 It is a small, (1/8” long (3 mm)) reddish-brown to black-brown beetle. The overall shape of the body is slim and cylindrical. The hood shaped rounded neck shield extends over the head hiding it. Pits on the shield become gradually smaller towards the rear. The last three segments of the antennae form a loose club. Adults can fly. Eggs (up to 500 per female) are laid either on kernels of grain or loose I the frass produced by the insect. Moisture content of the grain can influence oviposition and developmental rates. For example, no eggs are laid on wheat with a moisture content below 8%. The egg stage lasts 32 days at 18.1 ˚C (65˚F) to about 5 days at 36˚C (97˚F). Larval development is more rapid on whole grain than on meal made from the same grain. Young larvae cannot penetrate undamaged kernels. If inside whole kernels, larvae molt four to five times, where as if in whole meal, they will molt two to seven times (usually three to four). Larval development usually takes 27-31 days at 28˚C (82.5˚F) and 46 days at 25˚C (77˚F). Pupation takes place in an enlarged cell where the larval feeding tube ends. The duration of the pupal stage is approximately 5-6 days at 28˚C (82.5˚F) and 8 days at 25˚C (77˚F). Callow adults remain in the kernel for 3-5 days after ecolosion before beginning to feed and tunnel out of the kernel. Oviposition starts approximately 15 days later and can last up to 4 months. Females survive for several days after oviposition ceases. Adult lesser grain borers fly readily, at least during certain times of the year. They are not strong fliers, often being carried by air currents. Both adults and larvae cause considerable damage. Adults have very powerful jaws, powerful enough to bore into wood. 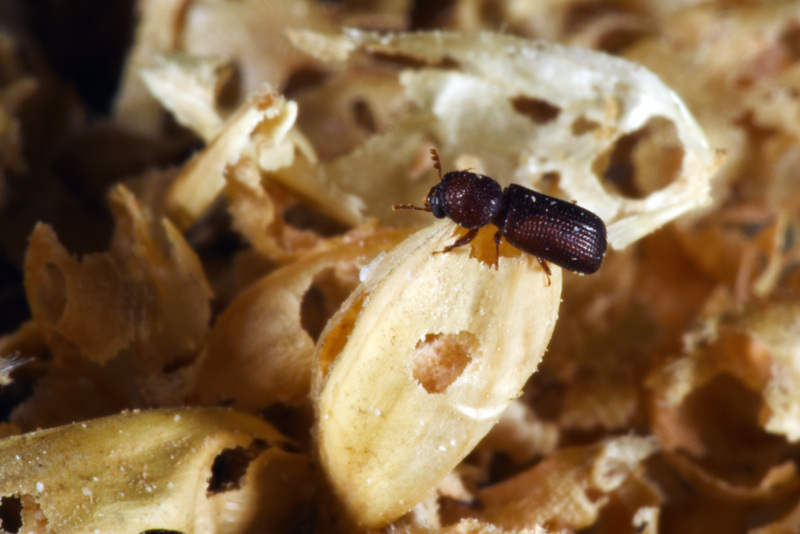 Lesser grain borers feed on a variety of foods, mainly cereals, but also include flour, macaroni, beans, chick-peas, dried potato, edible bulbs, lentils, herbs, and wood in their diet. Preferred grains include wheat, rye, corn, rice, and millet. Oilseeds and spices are not suitable for larval development. In homes, the infested food should be discarded and the cabinets thoroughly cleaned. In large quantities of grain, the only way to control these pests is fumigation. Since it is an internal pest residual control will only kill exposed adults. To kill the internal stages (larvae and pupae), you must fumigate. Heating grain to 60˚C (140˚F) can kill larvae, however this may decrease germination and baking quality of flour. Grain heavily infested with lesser grain borers has a sweet and slightly pungent odor, and should be destroyed.